FONTANA ERMES SPA, Kolbász- és szalámikonzervek, Hús- és hentesáruk, the ribboned ham, az EUROPAGES oldalakon. Ermes Fontana Spa was founded in the late 1950s. 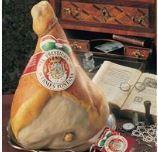 It is one of the Parma ham producers that can claim to perpetuate the oldest and most prestigious traditions in the art. Over the years it has combined the irreplaceable ancestral know-how of human beings with the most modern technologies from its base in the heart of Val Baganza.